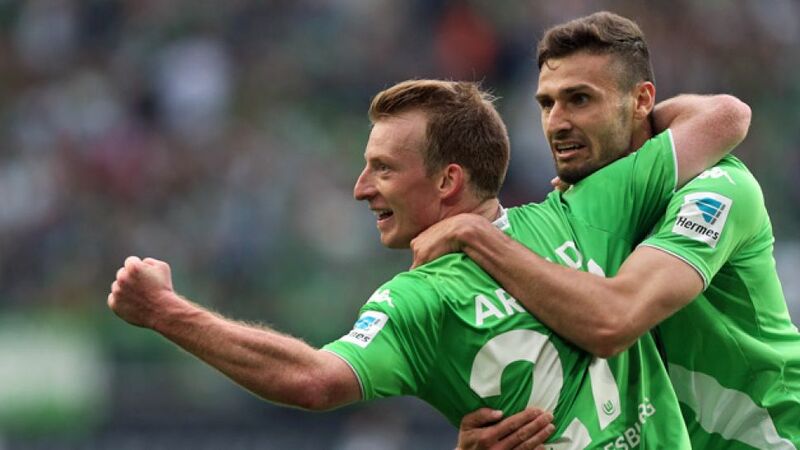 Wolfsburg - With UEFA Champions League qualification the target, the pressure already appears to be getting to VfL Wolfsburg. A combination of injuries, new players and some remarkable misses in front of goal has left the Wolves in 12th place, with one point from two games, and searching for form. Granted, an opening-night trip to reigning champions FC Bayern München is the hardest way to begin a season, but Dieter Hecking’s men followed up the 2-1 defeat by throwing away three points against Eintracht Frankfurt on Matchday 2. This week’s injury setback for Bas Dost aside, the unavailability of key players, FIFA World Cup stars Ivan Perisic and Diego Benaglio included, has hardly helped the side to settle into their role as Champions League contenders. Indeed, club captain Benaglio confirmed as much in a recent interview with WAZ. "It’s really annoying just to have a point when four would have been possible," said the 30-year-old, who has been suffering from a virus. "I’d prefer to be involved in the game, giving it my all." Benaglio’s statement that four points could have been possible is no exaggeration. No football fan could have avoided the social media frenzy when Junior Malanda missed an open goal with his side 2-1 down against Bayern. Simply rearranging his feet in front of goal would have ensured a point went north. The only thing more remarkable, perhaps, was the fact that, at 2-2 in the 92nd minute on home turf against Eintracht Frankfurt, Malanda did the same thing. "It’s not his best moment, for sure," pointed out his captain. "I said to him, though, that he cannot let his head drop." Malanda’s misses, although costly, are perhaps symptomatic of a side struggling to find its feet under the weight of new expectations. This summer's investment was aimed at fine-tuning a team which finished fifth and a point away from Europe's top table last term, yet the arrivals of Aaron Hunt, Sebastian Jung, Nicklas Bendtner and Josuha Guilavogui have in fact presented coach Hecking with an array of selection dilemmas. Maximilian Arnold has been one of last season’s stars to suffer from the new arrivals’ presence. After beating off competition from Diego and Kevin de Bruyne last season for his attacking midfield role, he is prepared to do the same thing again after the arrival of Aaron Hunt. "Last season, certainly, when de Bruyne arrived, I doubted my position," said the 20-year-old in an interview with transfermarkt.de. "This season, I don’t mind the substitute role, but I want to be in the starting eleven. I’m aiming to work really hard over the next few weeks and cement my position in the side." Arnold, one of the club’s two youth-teamers in the first-team squad alongside Robin Knoche, opened his season’s account against Frankfurt. Chipping in with seven goals last season took his side to the brink of a top-four finish, but ultimately culminated in UEFA Europa League qualification. It is a competition which has added to the club’s complications: they have been drawn in the group of death alongside LOSC Lille, Everton FC and FC Krasnodar. "It's definitely a tough task," Arnold pointed out, in reference to the draw. However, he believes that the new investment, despite forcing him to work hard for his place, will set the side up well for competing on three fronts. "We’ve definitely added quality with the new signings." One such recruit is Nicklas Bendtner, the Danish international striker, whose debut cameo against Frankfurt showed plenty of promise. Similarly to Arnold, he’s prepared to put in the hard yards to make the season a success, despite its inauspicious beginnings. "It was a fantastic welcome for me," said the former Arsenal FC man. "I want to be involved in every game from the beginning, so I’m going to have to work hard. With more training and more time on the pitch, my best form will come." With Bendtner, Arnold and Benaglio in such bullish mood, you get the sense it won’t be very long until Wolfsburg turn their form around.